One of the seminal Hollywood screwball comedies, My Man Godfrey (1936) has survived decades of presumed public domain status and, resultingly, extremely poor and cut home video versions. Criterion's new Blu-ray, licensed from Universal, fixes all that, offering a scintillating new HD transfer. Directed by Gregory La Cava, the film holds up well for the most part as a scathing satire of the Idle Rich during the Great Depression, though its faith that their humanity can be so effortlessly be redeemed now seems painfully naïve. 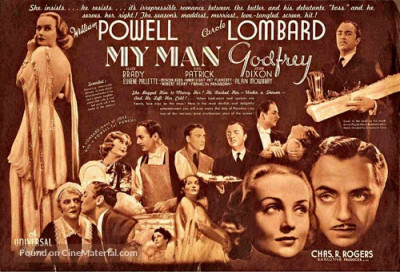 Regardless, the wit of the screenplay, chiefly by Morrie Ryskind, Eric Hatch, and an uncredited La Cava, from Hatch's story, "1101 Park Avenue," and especially the performances of stars William Powell and Carole Lombard and their peerless supporting players keep My Man Godfrey eminently entertaining. And Criterion's Blu-ray supports the picture with some thoughtful extra features. Appropriately, My Man Godfrey opens with a shot of garbage unceremoniously dumped into a Hooterville-type homeless community under the 59th Street Bridge. There resides Godfrey Smith (William Powell), the ideal "forgotten man" for socialites in evening gowns on a scavenger hunt. Competing sisters Cornelia (Gail Patrick) and Irene Bullock (Carole Lombard) approach Godfrey in turn, offering him five dollars to jump into their limos and allow himself to be humiliated in front of New York's elite. Rightly insulted, he shoves Cornelia to the ground and she runs off, but Godfrey is beguiled by Irene's innocent cluelessness. He returns with her to the hotel where the game is being headquartered, Irene wins her silver trophy, and then Godfrey tells everyone off, calling them a bunch of nitwits. Irene, feeling guilty, offers Godfrey a job as her family's butler. Amused by this, Godfrey accepts. The Bullock's Manhattan home is as stately and vacuous as its inhabitants. Matriarch Angelica (Alice Brady) is flighty by day and boozy by night, keeping a flamboyant "protégé," Carlo (Mischa Auer) around; Cornelia is patrician and condescending toward Godfrey, loving and hating him at once. Irene falls madly in love with Godfrey but he keeps a professional distance. Only the longtime cynical maid, Molly (Jean Dixon, very good), who also loves Godfrey; and Alexander Bullock (Eugene Pallette), the sardonic, personally and professionally beleaguered father, have any sense at all. Midway through, the appearance of millionaire Tommy Gray (Alan Mowbray) turns the story on its head, with Godfrey not exactly the person he claims to be. Having seen My Man Godfrey four or five times over the years, I was a little surprised to find myself liking certain aspects of the picture, others considerably less. For instance, while a great admirer of Carole Lombard, one of the most luminous talents of her era, highly watchable in anything, in My Man Godfrey this time I found her character, Irene, just a little too disconnected from reality to be believed, or that Godfrey would eventually fall in love with her, despite his obvious efforts not to. The empty-headedness of Alice Brady's character is one thing, but Irene is such a clean, ready-to-mold slate of amorality one wonders, beyond her obvious beauty, just what Godfrey sees in her, unless forming a basically immature, unformed person is exactly what he has in mind. For years even Godfrey's fans have been critical of its dénouement, the idea that the shantytown under the bridge could be transformed into "The Dump," a swanky nightclub providing employment for its formerly homeless residents. Dramas like Wellman's Heroes for Sale and Wild Boys of the Road (both 1933) and the little-seen but fascinating Beggars in Ermine (1934), to name three examples, explored homelessness and poverty more seriously, so it's not like My Man Godfrey exists in a vacuum, but that ending is in its own way as insulting as Irene and Cornelia casually treating a homeless man like a slave being readied for auction. Godfrey's moral, that rich and poor are cut from the same cloth, so we should all get along and help one another, and that Godfrey would facilitate this understanding among the Bullocks is an attractive idea, but the movie never even hints in what ways any of them might change their behavior. The movie also reflects the very 1930s concept that the rich led frivolous lives of empty-headed instant gratification, while the rest of us worked our fannies off and spent our limited free time on practical and meaningful matters. Yet the foolishness of the titled-class's scavenger hunt really seems no different than the silly games we now play on our computers to no purpose, or that the videos of cute animals we post on Facebook are little different from watching Carlo impersonate a gorilla and jump on the furniture. Has it all seeped down across all classes 80-some years since? And yet William Powell and Carole Lombard (recently divorced in real life but still respectful of their ex-partner's talents) are enormous fun to watch, especially Powell, one of the great understated reactors in film. The supporting cast is great, too, with many fine character actors (James Flavin, Edward Gargan, Franklin Pangborn, Grady Sutton) popping up uncredited. In 1.33:1 and black-and-white, My Man Godfrey was sourced in 4K from the original nitrate camera negative, and a composite safety fine-grain for some scenes. It looks excellent throughout, and the mono audio, supported by optional English subtitles, is clean and clear. Region "A" encoded. Supplements include another superb conversation with jazz and film critic Gary Giddins, previously seen and heard on King of Jazz. He's amazingly good at this, and would be welcomed on many more Criterion titles. Critic Nick Pinkerton looks at the career of director La Cava, while additional extras include outtakes (the actors' cursing somehow making everything feel very contemporary), a Lux Radio Theatre adaption from 1938, and a reissue trailer. What's billed as newsreel excerpts "depicting Great Depression class divides" sounds great in theory but the clips, provided by the WPA Film Library, seem like post-Depression commentaries using Depression-era footage, and aren't otherwise identified. A classic comedy that still charms today, My Man Godfrey is a DVD Talk Collector Series title.